Resilient flooring is a smooth surfaced flooring manufactured by first combining a plastic material with filler and pigments, then processing them into sheets of different thickness. If a backing material is used, the plastic sheet is joined to the backing. These products include solid vinyl, backed or cushioned vinyl, rubber, cork, and linoleum manufactured in tiles, strips, or sheet goods. This smooth-surface plastic floor is a mixture of vinyl resins, plasticizer, fillers and stabilizers with color added throughout the product. 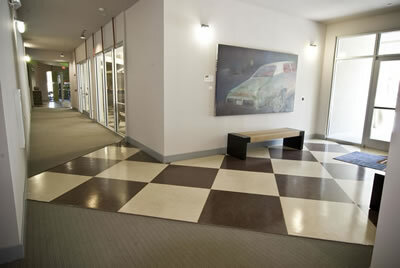 Solid vinyl flooring can be produced in either square tiles or sheet goods in 6, 9, and 12 foot widths. This is an ideal choice for medical facilities such as procedure and operating rooms. Vinyl Composition Tile (VCT) is floor tile made from vinyl resins and filler materials to create resilient flooring in assorted colors and patterns. VCT is typically used in break, copy, and storage rooms. Manufactured in much the same way as VCT, Static Dissipative Tile (SDT) is designed to dissipate static charge in rooms which house technical equipment such as I.T. rooms, telephone rooms, and computer training rooms. This product offers the same durability, install cost, and ease of maintenance as VCT while preventing damage to sensitive equipment.